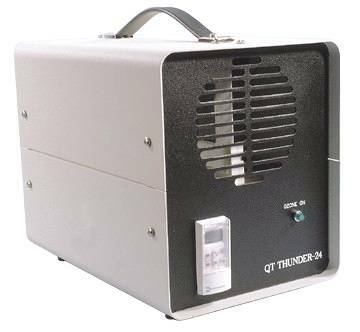 QT Thunder-24 eliminates odors on a programmed basis without the attention of an operator. For areas up to 10,000 cu/ft with ongoing odor problems such as locker rooms, school rooms, day care centers. This compact unit gives you the freedom of setting a schedule for treatment and then forgetting about it. Easy programmable 7 day, 24 hour, 6 cycle timer. Internal backup will save the programming for 30 days without power.